Pressure to follow public opinion couldn't get much stronger. National hero Eric Liddell is Scotland's pride and joy. The entire country is eager for their running celebrity to sprint past the rest of the world and bring home Olympic gold in the 100-meter race. But when Eric makes the stunning announcement that he won't race on Sunday because of his religious convictions, he is soon labeled a disgrace and a traitor. 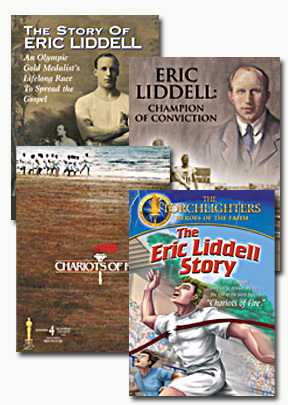 See how Eric Liddell's famous stand during the 1924 Olympics prepares him for even greater challenges as a missionary to China during World War II. Torchlighters is a series of animated programs for youth ages 8-12, presenting the lives of true-life heroes from Christian history. When kids see what God can do through a "Torchlighter" who is devoted to carrying out His will and purposes, they too may want to carry a torch of faith by serving Him. Customers in Australia or New Zealand, please visit Christian Multimedia. This fascinating documentary presents the details of Eric's life, who was perhaps best known as an athlete in the 1924 Olympics, as depicted in the Academy Award-winning film, "Chariots of Fire." His story is told by David McCasland, author of Eric Liddell: Pure Gold, Eric's daughter Patricia, and Rev. John Keddie, consultant on "Chariots of Fire," along with fellow prisoners from the internment camp in China. Growing up, Eric was a gifted athlete, excelling in rugby and later in track. He entered the 1924 Olympics in Paris and was favored to win the 100-meter race. But when he learned that he would have to race on Sunday, he refused. Instead, he competed in other races and still brought home gold for Scotland. Now a national hero, Eric announced his intentions to go to China as a missionary. There he taught Chemistry and oversaw the school's sports programs, sharing his faith at sporting events. He later married, then left teaching to become an evangelist By 1941, China was becoming more unstable and Japan was increasing its control. Concerned for his family's safety, he sent them off to Canada while he remained in China. It wasn't long until the Japanese began moving people into internment camps. There, Eric became friend and mentor to 300 children, many of whom were separated from their missionary parents. Fellow prisoners observed as he rose early each day to read and pray. He continued living out his faith in the camp and was admired and respected by all. In 1944, however, he began showing signs of a possible brain tumor and died the following year.